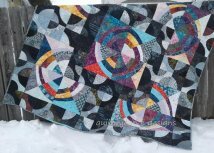 What's New @ Cut Up & Quilt! Iowa Strong - Nebraska Strong! Happy Easter Everyone! May your Easter be blessed with sunshine, happiness and opportunity. While spring is truly upon us, our hearts, prayers, and support go out to those affected by the floods. We continue to be a drop off site for quilts intended for flood victims. Jeanine Williams from Quilts of the Bluffs is collecting them for careful and considerate distribution of those who lost so much in the flood. We have collected over 30 quilts at this time and more continue to come in. As we continue to accept quilts we're also collecting socks and underwear for all sizes; boys and girls; children and adults. If you are wondering how else you might be able to help, contact the Mills County Emergency Management Office. *This would be a great time to bring in socks and underwear donations for families affected by the floods. Stellar Starburst is our next block of the month. It was brought to our attention by a customer and we found it so striking we jumped on board! We're using Timeless Treasures fabrics with a bit of bling to them. 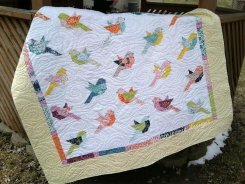 This fun quilt uses only seven fabrics and is suitable for all skill levels. The quilt pattern has three size options. We'll be doing the Large 106" X 106" as our shop BOM. However, we will be happy to kit up any of the three size options as a whole kit option. Monthly Payment: $19.99 for 12 months. 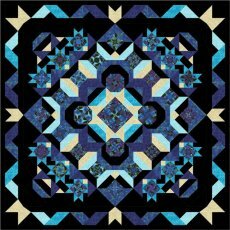 Includes pattern, fabric for the large size quilt and binding. Preorders for Complete Kits are available and ready for pick-up on June 1st. Check out the classes/calendar page for our current list of classes and events. It's always changing with new additions that sometimes don't make it to the newsletter. Just click on the class you want and register on-line or in the shop. If the class is full, please add your name to the waiting list. It helps our instructors determine if another class will be added. Please give us the courtesy to let us know if you cannot attend. It gives us a chance to contact someone who would love your spot. We will refund your registration if we have at least a 24 hour notice. 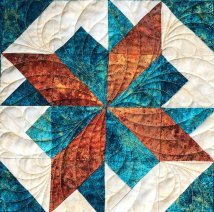 Karen still has space in the Double Struck Star Class scheduled for Saturday, April 27th. . 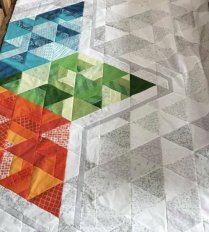 This quilt uses the Creative Grids 60 degree Diamond Ruler she demonstrated at our Anniversary celebration in September. You might have that ruler in your repertoire. If not, we do have them for sale in the shop. 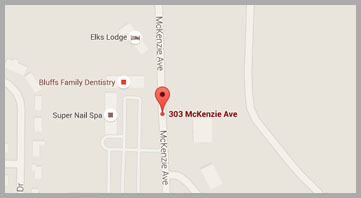 If you don't want to take the class but you would like to come in to sew and use her expertise while it's available. She has opened up a few seats as a UFO. J ean starts out the month of May with a Light Up the Dark class for those of you who love curves, or want to tackle curves in a friendly way. The quilt is hanging in the classroom and has caught a lot of attention. 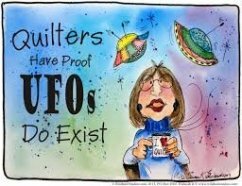 Jean has scheduled a UFO on a Thursday evening, May 30th for those who might not be finished with one of her class projects. This gives you a chance to have Jean handy in case you have questions. Jean kicks off the month of June with her Feathers class. It is already drawing lots of attention, so you won't want to wait to sign up for this one. Northcott is celebrating 10 years of the Stonehenge Collections. They have designed the Solstice Collection to celebrate. There are two contests underway, The International Block Party and the Panel Challenge. We've received orders for our block kit from all over the U.S. It's exciting to see where our blocks are going and we will be excited if our block ends up in the winning quilt. The Panel Challenge is a within shop contest. You just never know, you might be the winner! Our block was designed by our local designer, Karen Burns, also known as the Warped Spinster. She graciously designed this block for us to use as we wish and we are pleased to offer it to you in our Stonehenge Block Kit! Quilts, Socks and Underwear Donations being accepted for the Mills County Emergency Management Center. Happy Easter from Cut Up & Quilt!